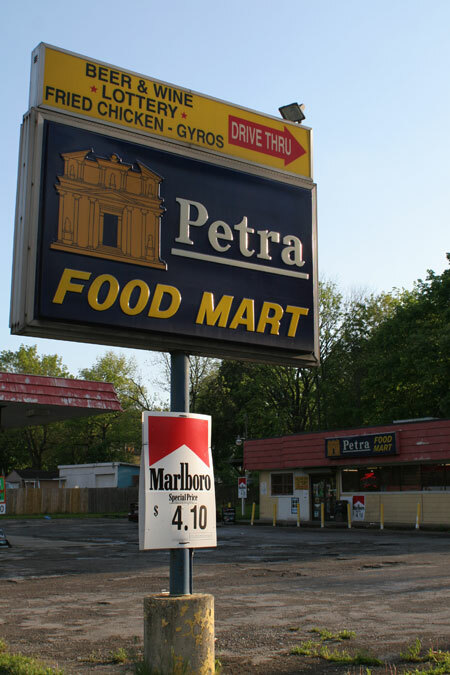 Two worlds collided when I passed the Petra Food Mart on Youngstown’s north side yesterday. This little mini mart sits among urban squalor where locals stock up on beer, cigarettes and lottery tickets. Weeds poke up through the asphalt, and the red paint is peeling from the roofs. 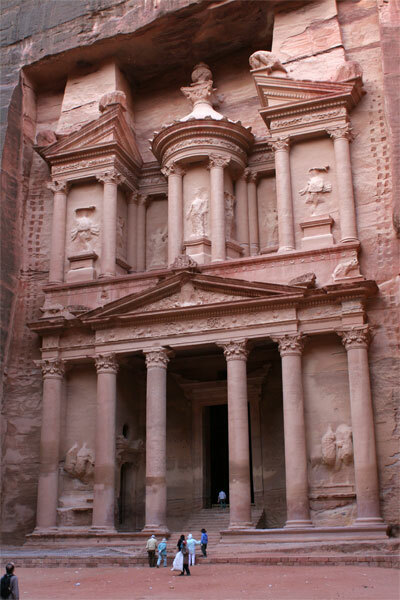 But the sign shows the proud facade of the Treasury, an amazing ruin in the ancient city of Petra, the top tourist site in Jordan, which I wrote about in an article and video in a recent issue of Budget Travel. A bit of cognitive dissonance as my more recent life clashed with scenes from my younger days. The city where I went to college still struggles after its major industry died 30 years ago. The steel plants are mostly gone (though the plant in a nearby town where my father worked for nearly 40 years is being bought by a Russian company), and the downtown has made attempts at revival, with a thriving and spot-clean University, a few federal buildings, a prison, a new arena and newish performance venues. But so much of the city surrounding it has lapsed into a rust belt malaise. Driving on the north side of Youngstown, Ohio, I passed the stately homes of former steel executives, still kept up by the upper class who sit atop this struggling city and stay put out of civic pride. But on the side streets, merely blocks away from the manicured lawns of Fifth Avenue, are rows of homes in disrepair. Many have amazing craftsmanship inside: you couldn’t build these houses this way again, with the mahogany wainscots, the crown molding, the banisters and hardwood floors. This is where students used to live before the University put in more residence halls. For four years, when I was in college here, I lived above a flower shop a few blocks from the Youngstown State campus. The shop is still there, and has expanded to two store fronts, but the neighborhoods surrounding it are falling apart. With so many foreclosures and abandoned homes (the city has had a declining population for the past two decades and there’s a backlog on demolitions), there are vacant lots where houses once stood, for sale signs in front of monstrous, dilapidated places, and plywood or open air where there were once windows. Four bedroom houses sell for as low as $10,000. And that’s where those with a little bit of cash (or financing) can find amazing opportunities. My friends who are getting married this weekend have bought the estate of a former prominent family, and it has a dizzying number of beds and baths; well-appointed fixtures and cedar closets; a prohibition bar in the basement, complete with peephole; and servant call buzzers in all the rooms, which ring in the kitchen where a tote board with metal arrows points to the room where the buzzer was rung. Last night, my friends christened their home with music and performance in the expansive living room. Like the flowers that rise in the cracks of concrete, there are always roots and shoots, those spirits who will not be daunted by the decay and look at every opening in the asphalt jungle as an opportunity to plant anew. They talk of community gardens and grassroots arts programs. I am grateful that I know so many of these types; they give me hope for this town. So you could buy 10 houses in Youngstown…or one parking space in Brooklyn.